Oil prices are not feeling the love this morning, though across-the-board red numbers are perhaps appropriate for the holiday. Crude oil prices are continuing to fall, taking us back to prices not seen since December. After giving up almost 50 cents yesterday, crude oil prices are currently trading 78 cents (-1.3%) lower at $58.41. 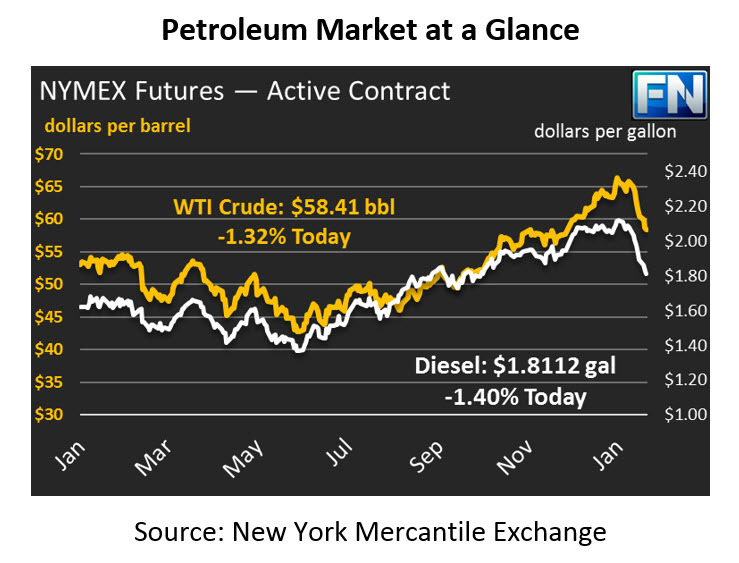 Although the stock market has managed a three-day winning streak, oil prices have struggled. In the past eight trading sessions, oil markets have only ended positively once, with a pitiful 9 cent gain on Monday. In that same period of time, diesel has not had a single up day, and gasoline only managed one small rally yesterday. With prices falling so steadily, it’s likely that prices will continue falling, right? Nope. This bearish turn came without warning or clear catalyst, and a reversal could come just as quickly. That said, higher prices are far from guaranteed. Although refined fuels have been following the downward trend, price action was mixed yesterday. Diesel prices gave up half a cent yesterday, while gasoline actually rose by half a cent. Today, both products are solidly in the red with nearly 2.5 cent losses. Gasoline is currently trading at $1.6621, while diesel prices are $1.8812. Yesterday’s API report showed across-the-board inventory builds. Gasoline stocks rose faster than market expectation (surprising given 0.5 cent gain yesterday), but crude and diesel stock increases were mostly within expectations. Various reports from the IEA, EIA, and OPEC point to rising inventories in 2018 as U.S. production outstrips demand growth, which has contributed to the bearish market atmosphere. The IEA reported that OPEC has nearly accomplished their goal of clearing the oil supply glut, but warned that rising U.S. production could undo their accomplishment. Speaking of rising production, a new milestone was announced this week. A supertanker is set to load from a U.S. imports terminal in Louisiana, the first time a “very large” tanker ship (capacity over 2 million barrels) has loaded directly from a U.S. terminal. In the past, super tankers leaving the U.S. had to be filled by smaller vessels taxing back and forth to the mainland. This new export opportunity will continue to integrate American oil into the global supply market, making the U.S. a key international energy player. Reuters published an article yesterday noted physical crude markets suggest continued price declines, at least in the short-term. While major indexes such as Brent and WTI crude are subject to the whims of financial speculators and investment banks, lesser-known indexes such as Brent Forties crude, Russia’s Urals, and Atlantic diesel markets are more responsive to fundamental supply/demand needs. Prices in these indexes have fallen relative to mainstream financial contracts, suggesting the fundamentals do not support current WTI crude levels. Of course, financial markets don’t always follow the physical trend, and there’s no way to know whether the decline in physical market prices is a long-term trend or not.